We are a leading Manufacturer of super hot 4 insulated tiffin, passion 2 insulated tiffin, stylo 2 insulated tiffin, passion 3 insulated tiffin, stylo 3 insulated tiffin and super hot 2 insulated tiffin from Sonipat, India. With an aim to stand high on the expectations of customers, we are engaged in manufacturing, supplying and exporting Super Hot 4 Insulated Tiffin. 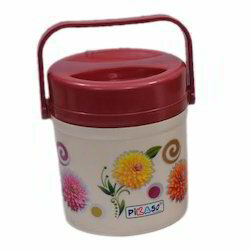 We have been remarkable in manufacturing a large collection of Passion 2 Insulated Tiffin. These are mainly used by students and employees. 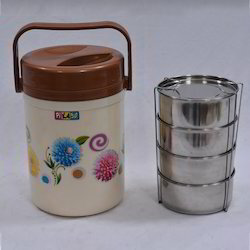 We have been remarkable in manufacturing a large collection of Stylo 2 Insulated Tiffin. These are mainly used by students and employees. Our specialization lies in offering a distinct range of Passion 3 Insulated Tiffin. This tiffin is known for keeping food fresh, tasty and hot for many hours. 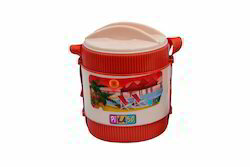 Our specialization lies in offering a distinct range of Stylo 3 Insulated Tiffin. This tiffin is known for keeping food fresh, tasty and hot for many hours. We are offering to our clients an exclusive range of high-quality Super Hot 2 Insulated Tiffin. 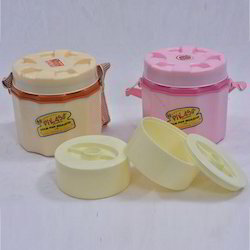 These Containers are made by using the high quality raw material. Our range of Foil Printed Containers is widely appreciated by our clients. With an aim to stand high on the expectations of customers, we are engaged in manufacturing, supplying and exporting Super Hot 3 Insulated Tiffin. 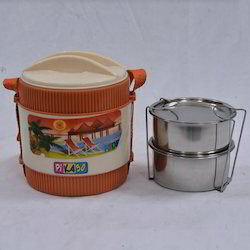 We offer wide range of Super Hot 1 Insulated Tiffin Box.